Don't let anyone tell you disposable tableware can't be classy. 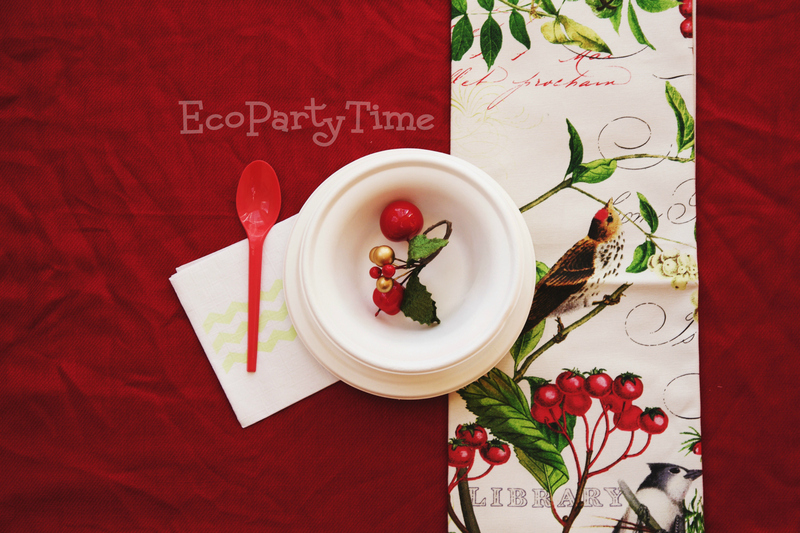 It can be easy to achieve an elegant table set up with Ecopartytime's Sugarcane Biodegradeable Tableware. 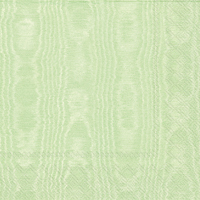 The square plates in particular look exceptionally sophisticated when paired with an emerald green tablecloth. 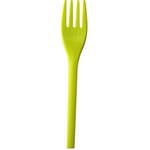 Ecopartytime's Compostable White Utensils are definitely a step up from the usual clear disposable utensils. To make the whole set up a little more festive I added some gold accents with golden jingle bells and Embossed Gold Napkins. Sometime the most stunning place settings are the most simple ones. 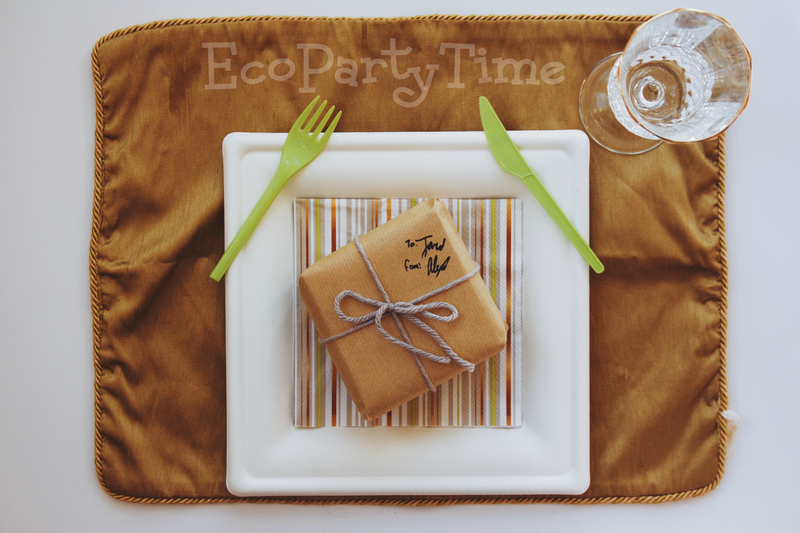 This particular rustic place setting was achieved with a paper tablecloth, Ecopartytime's round Biodegradeable Tableware, and Ecopartytime's Compostable White Utensils. I used beautiful Snowflake Cocktail Napkins as the center of attention. 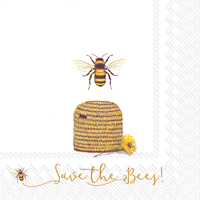 These recycled napkins tie together the brown paper tablecloth and the white plates. 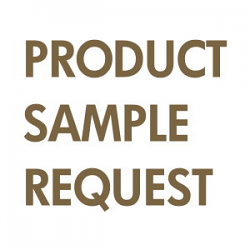 These napkin also make great coasters for hot beverages during your holiday get together. This bright and cheery place setting is ideal for a Christmas party! 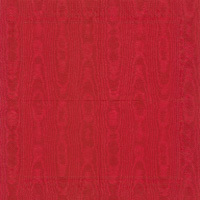 You can easily achieve a similar look with Ecopartytime's Red Patterned Compostable Tablecloth. And who doesn't love to warm up with a nice bowl or soup or curry during winter holidays? Compostable Bowls are definitely a more stylish option than typical styrofoam bowls. I paired the white bowls with Red Compostable Utensils and Green Patterned Cocktail Napkins to create the perfect balance of red, green and white. Celebrate the snowy winter season with a Snowflake Chic tea party or hot cocoa night. 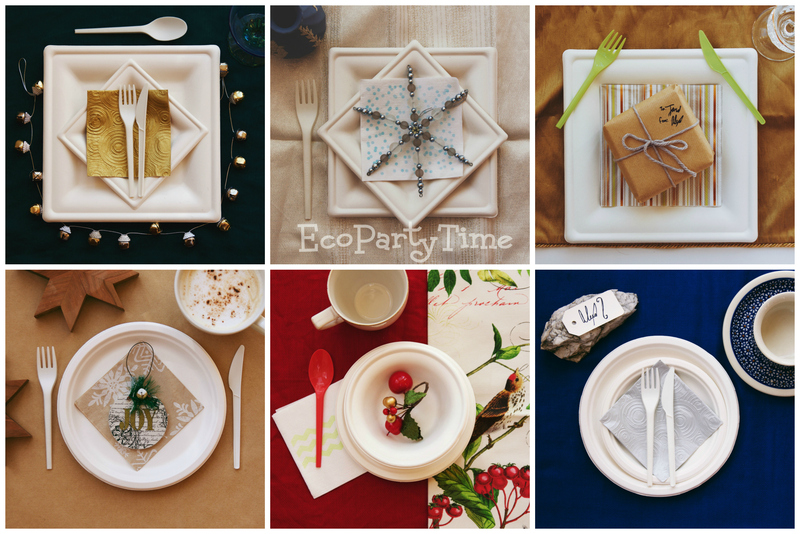 Ecopartytime's small Biodegradeable Square Plates are perfect for or horderves or appetizers. Recycled Blue Patterned Napkins will add to the snowflake theme! I love when part of the table decor is also a gift for my guests. 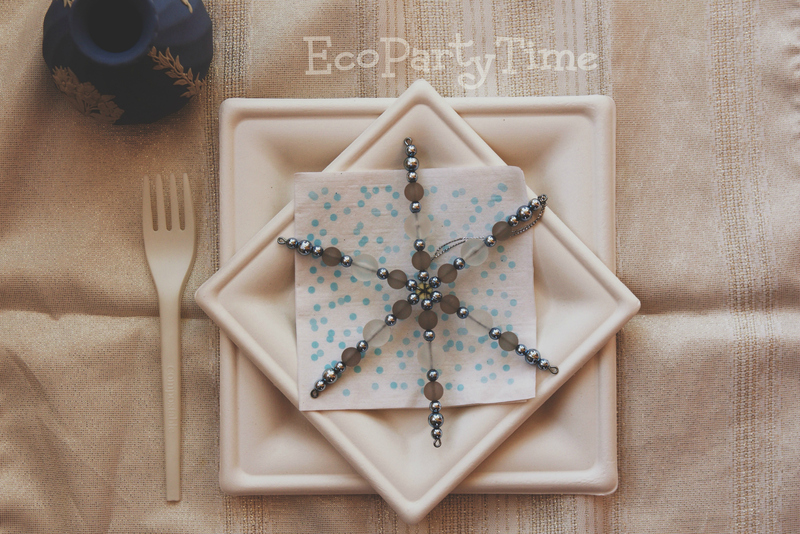 Ecopartytime has beautiful Fair Trade ornaments like these Mache Double Star Ornaments that your guests will love to take home! Silver & Gold is a classic color combination during the Christmas season. 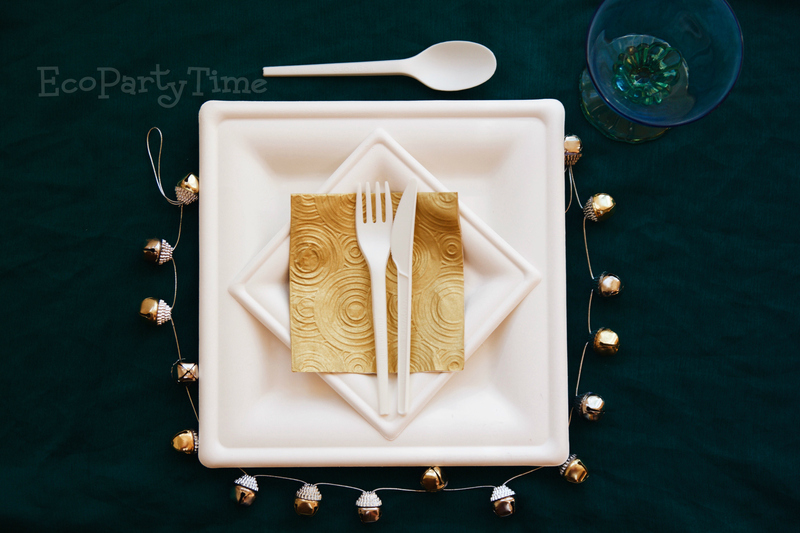 For my Silver & Gold place setting I added some nice hints of green using Ecopartytime's Green Compostable Utensils. I also used Ecopartytime's Glitter Stripe Napkins as the center of attention. These beautiful napkins tie together all the colors used in this particular place setting. To complete the look I used a small gift as decor. 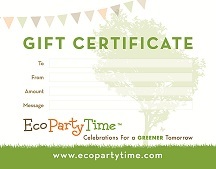 You can use Ecopartytime's Manila Hemp Twine Ribbon to wrap any of your holiday gift with eco-chic style. If you're wanting a table setting that is modern and refined then a Royal Blue setting is perfect! 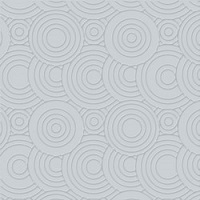 For this I used Round Sugarcane Biodegradeable Plates. 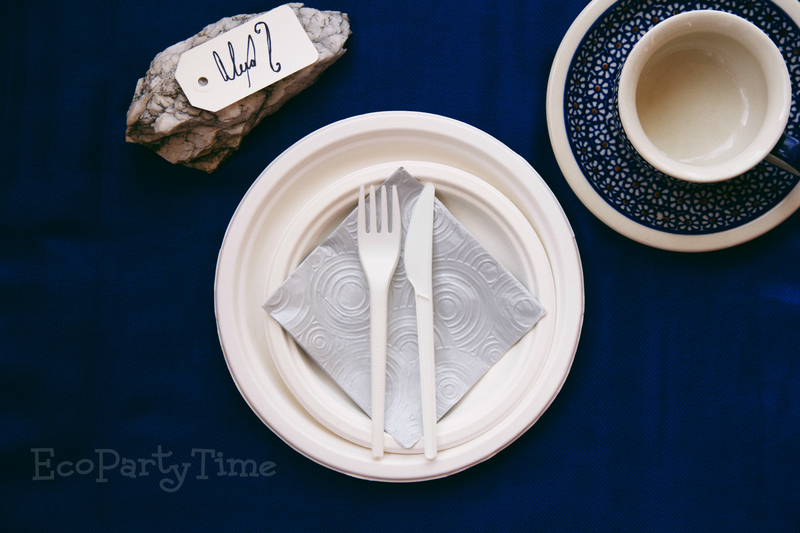 I also used Ecopartytime's Embossed Silver Napkins since the silver pairs well with the royal blue. 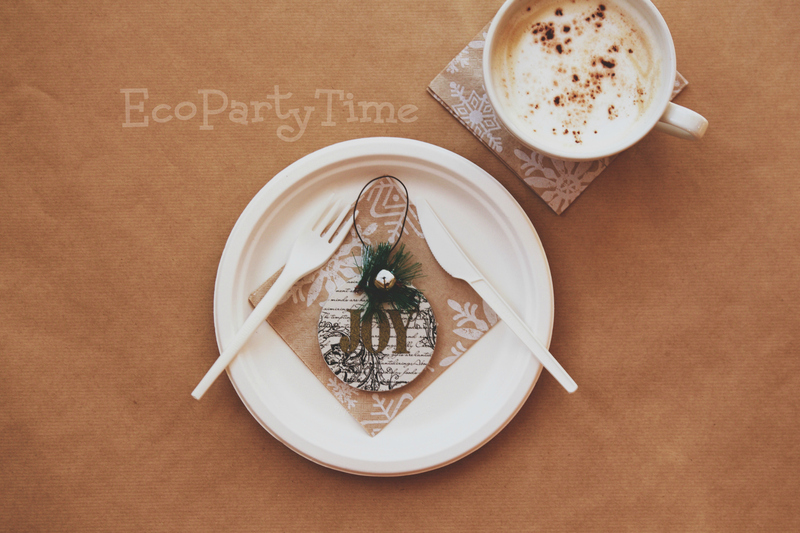 If you want to take your table setting to the next level, I highly recommend Ecopartytime's Modern Paper Confetti. Confetti will make the table setting perfect for a New Year's wedding or celebration.